Two new photos have been released for The Hobbit: An Unexpected Journey, giving us a before and after glimpse at motion capture master Andy Serkis portraying Gollum. The first photo shows the actor in his motion capture suit, interacting with star Martin Freeman on the set. 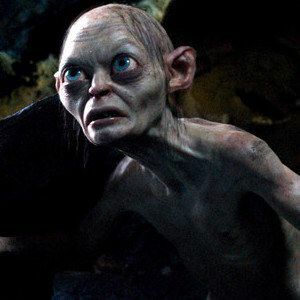 The second photo gives us a new look at the final, CGI-rendered look of Gollum. Take a look at these precious shots from director Peter Jackson's Middle Earth prequel.